My Name is Nathan I am 21 years old and from Leeds. I’ve always had a passion for the outdoors and prior to this project studied Outdoor Adventure Sports at Askham Bryan College. 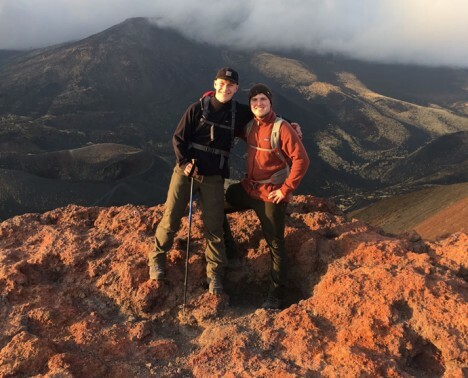 During my time at college I learnt many things, such as; how to manage a group in an Outdoor and potentially dangerous environment, leading a group on mountainous terrain as well as a good understanding of both geology and volcanology. All of which are transferable to the project I am currently on. Since arriving in Sicily the guides at Etna Finder, as well as Lorenzo our tutor, have educated us on both the general life and culture of Sicily as well as “Mama Etna” herself. For the first month or so a lot of the time me and my Friend Walter sat in on the tours almost as if we were customers, this allowed us to observe the techniques used by the guides as well as expand our knowledge on the area. The thing we both noticed immediately was the amount of passion the guides had towards Etna, they don’t see Etna as a Volcano they see her as a Mum, that provides them with food and protects them from the cold northern winds. The tours themselves are never the same, we often visit places like; The Bove Valley, a huge valley on the east side of Etna in which many Lava flows are easily visible. Grotta dell’ Neve, a lava cave that was used hundreds of years ago to preserve and store ice for the summer season. The Sartorious Craters, a series of secondary extinct craters that were formed in 1865. And of course the summit area of Etna at which the views are mesmorising and youre able to gauge the true size of Etna. Also Etna Finder run wine tours, these tours consist of a morning on Etna followed by an afternoon at a winery at which the guests can try wines produced on and around Etna. After the wine tasting the winery provides both us, the guides, and the customers with a HUGE meal usually three courses, a pasta dish followed by a meat dish and then desert. After the first Month of tours and a bit of studying Walter and I are now able to provide some input and share our knowledge with the customers. And I am sure with some more practice will be able to take a tour ourselves. Outside work we have done a fair bit of exploring, Mainly around Catania which is the closest big city to us around 13km away. We also took a day trip to Taormina, a touristic town where we went snorkelling. The town we are currently staying is called Viagrande its relatively small but is convenient for us as it’s where the work office is based. We have met a fair few locals, all of which have been very welcoming and accommodating to us and have even made a few friends around the area. We have also been on a few days and nights out with the guys from work. Catania itself is booming on a night, there are frequent festivals and events and even if there isn’t there is always something to go and do or see. The first thing you notice when arriving in Sicily is how crazy the roads are, just a few steps out of the airport and it’s evident. Lorenzo was quick to tell us this however and went on to explain that the stop lines are not an enforcement but instead, a suggestion. Many of the customers on the tours have also mentioned it but after a few days you get used to it. The other problem we often face is the language barrier, however everyone around us seems keen to help as well as practice their English and improve our Italian so it’s not too big of a problem and I do believe we have learnt enough to get by for now. Overall my first 6 weeks in Sicily have been really enjoyable and I am very excited to learn more about Etna as well as the Italian language.